Angiogenesis, the formation of new vessels from existing microvasculature, is a tremendously complex and intricate process, essential for embryogenesis and development of multicellular organisms (1), but it occurs only rarely in adult tissues in a tightly controlled manner during normal wound healing and the female reproductive cycle (corpus luteum, placenta, and uterus) (2). When these tight controls are breached, the result is unchecked angiogenesis, which has been implicated in the development and progression of a variety of diseases (Table 1). 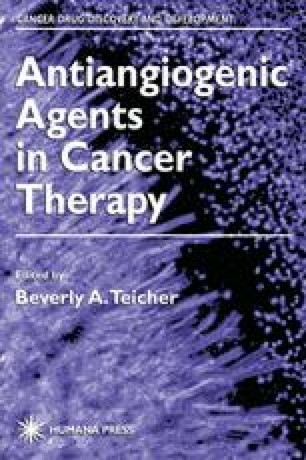 The prevalence of pathologic angiogenesis in human diseases, and the significant mortality associated with these disorders, underscore the importance and emergence of antiangiogenesis therapy as a major clinical tool. In the case of solid malignancies, the generation of proangiogenic substances is in part caused by the pathologic microenvironment that develops in response to uncoordinated vascular production.